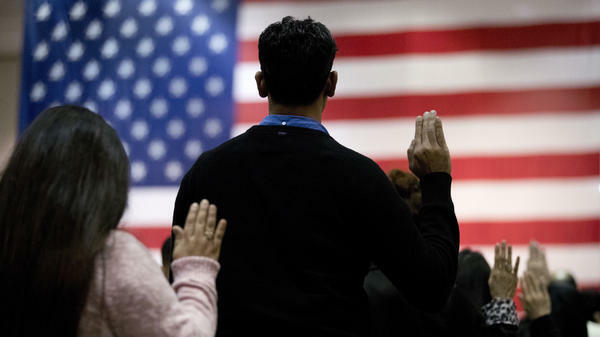 People take the oath of allegiance to become U.S. citizens during a naturalization ceremony at the Los Angeles Convention Center in 2017. "We process many surveys with incomplete responses. The census [was] certainly one of those [surveys] in the past. It will be in the future," the bureau's acting director, Ron Jarmin, testified on Capitol Hill during a House Appropriations Commerce, Justice, Science Subcommittee hearing on the 2020 census. Asked by Democratic Rep. Grace Meng of New York whether people who don't fill out the citizenship question on the census form would be counted, Jarmin replied, "Yes, but we would definitely encourage people to fill it out as completely as possible." Calls to boycott the census have been circulating on social media since the addition of a citizenship question to the 2020 census form was announced in late March, despite warnings from lawmakers and civil rights groups about the long-term consequences of a census boycott on public policy, federal funding and health research. There have also been suggestions to just ignore the inquiry about U.S. citizenship status while answering the other census questions. Refusing to answer any census question, or intentionally giving a false answer to one, can result in a fine, according to federal law. And returning an incomplete census questionnaire may lead to a phone call or an in-person visit to your home by workers from the Census Bureau, which hired more than 600,000 door-knockers to follow up with households that did not respond to the 2010 census. That's because the U.S. Constitution requires the government to count every person living in the country once a decade. The data the census collects are used to reapportion seats in the House of Representatives, draw legislative districts and distribute an estimated $800 billion in federal funds every year. The Census Bureau has not asked all U.S. households about citizenship since 1950. Commerce Secretary Wilbur Ross, who oversees the Census Bureau, approved adding the question to the 2020 census last month after reviewing a last-minute request from the Justice Department, which says it needs a better count of voting-age citizens to enforce the Voting Rights Act's provisions against voting discrimination of racial and language minority groups. Critics of the question say the estimates of U.S. citizens the DOJ currently uses are sufficient, and they cite the bureau's own research suggesting that asking about citizenship on the census could lower the response rate among immigrants and communities of color. To fill in the blanks on 2020 census forms, the bureau is planning to use, for the first time, personal information from federal and state records, such as tax returns and Medicaid applications, as well as public utility records. The Census Bureau is discussing whether to use administrative records to answer the citizenship question on incomplete questionnaires and has not made a decision yet, the Census Bureau's head of the 2020 census, Albert Fontenot, told NPR after speaking at the Population Association of America's annual meeting. During Wednesday's two-hour hearing on Capitol Hill, Meng and other Democratic lawmakers — including Reps. José Serrano and Nita Lowey, both of New York, and Rep. Derek Kilmer of Washington state — repeatedly raised concerns that the citizenship question would discourage noncitizens, especially immigrants without legal status, from filling out the census at all. Jarmin acknowledged "there could be some" impact on response rates among noncitizens and other immigrant groups. Federal law prohibits the Census Bureau from releasing information identifying an individual to other federal agencies, including Immigration and Customs Enforcement. But the bureau can share data at the neighborhood level about specific population groups, as it did during World War II when the government targeted U.S. citizens of Japanese descent and forced them from their homes and into incarceration camps. "Many communities want assurances and deserve assurances that something like that, which happened to American citizens, would not ever happen again," Meng told Jarmin during the hearing. The bureau has previously apologized for its role in the incarceration of Japanese-Americans and increased protections for people's personal information after the war. Jarmin noted, however, that there remains a tension between "data users who want more accurate data at a more granular level and trying to protect the confidentiality of individual households." With less than two years before the head count begins, it's not clear if the citizenship question will stay on the final 2020 census questionnaire. The question has launched a legal fight involving multiple lawsuits trying to get it removed. In Congress, Democratic lawmakers are working on bills that would block the question. Jarmin told lawmakers that he hopes the questionnaire will be finalized by this fall. Any changes to the questions introduced next year, he warned, are "going to cost money."